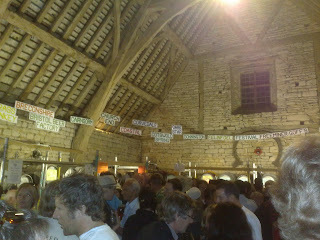 I was welcomed to the 33rd CAMRA Cotswold beer festival on 25th July 2009. This is the 5th year I have been. 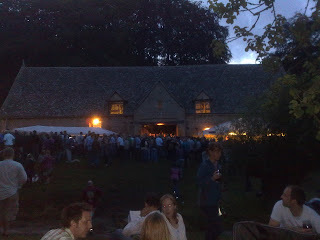 Set in the grounds around the Manor Houses Tythe Barn at Postlip Hall nr Winchcombe you couldn't ask for a better setting for a beer festival. There was again a very good selection of beer regional and from all over the country. Entertainment Saturday evening was by Anything Goes an entertaining upbeat live jazz band. On arrival you get given a program and can buy beer tokens as you approach the Tythe Barn where all the beer is housed. On entry you are given a glass in exchange for your ticket. Food comes in the form of a BBQ burger and hot dogs. 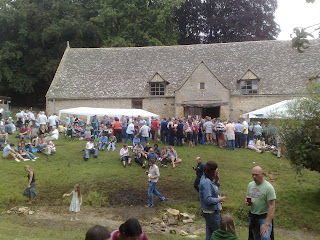 The Cotswold Beer Festival is this weekend again at Postlip Hall. Come along for some Good Beer.